DANIEL SILVA FERREIRA MAU BERE, a BS Civil Engineering student from East Timor, was declared Finalist in the 49th Search for the Outstanding International Students in the Philippines by the Philippine International Friendship and Understanding Association, Inc.
Mr. Ferreira is currently the Secretary-General of SPUP’s International Students’ Association as well as an officer of the Paulinian Student Government (PSG) of the School of Information Technology and Engineering and the SPUP Chapter of the Philippine Institute of Civil Engineering Students (PICES) aside from his being the Team Captain of SPUP’s Football Team. The said annual search aims to focus community interest upon the presence of foreign students in the Philippines; identify leadership potentials and capabilities among foreign students; encourage social consciousness among foreign students; promote international friendship and understanding through friendly concern for the welfare of foreign students; and, motivate foreign students to attain quality scholastic performance. 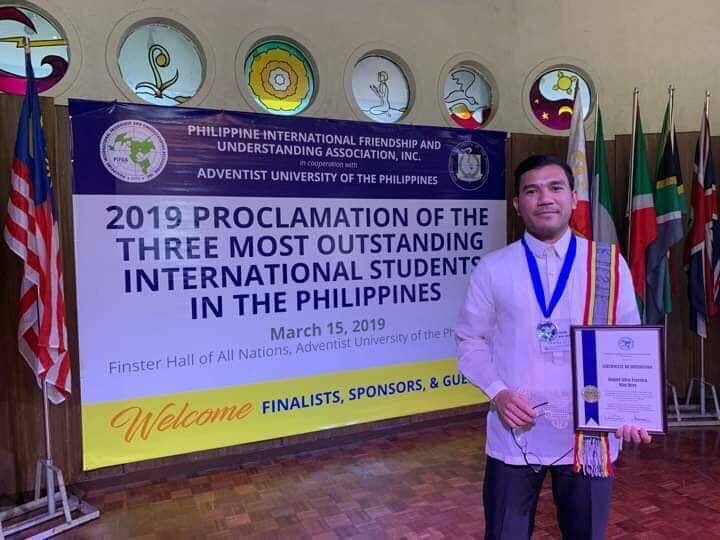 Dr. Jeremy Godofredo Morales (Director, International Relations) accompanied Mr. Ferreira in receiving the Certificate of Recognition and Medal during the awarding ceremony at the Adventist University of the Philippines, Silang, Cavite on March 15, 2019.